This post contains affiliate links and swap items. One of my favorite things regarding blogging is having the opportunity to meet people and build friendships. I originally meet Miss Fely at a conference in Los Angeles and we have collaborated once a month since then. For this months topic we decided on a beauty swap, which is also another favorite thing of my. Una de mis cosas favoritas en cuanto al blogging es tener la oportunidad de conocer gente y hacer amistades. Originalmente conoci a Miss Fely en una conferencia en Los Angeles y hemos colaborado una vez al mes desde entonces. Para el tema de este mes nos decidimos por un canje de la belleza, que es también otra cosa favorita de mi. In the past I have done several swaps but none with people in the U.S. which is a total different experience. The process was super fast as we decided the budget and sent within a week! 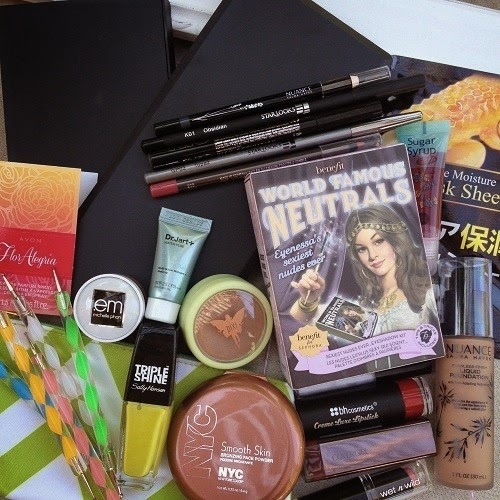 I sent Miss Fely a few of my favorite beauty items and vise versa. En el pasado he hecho varios swaps pero ninguno con la gente en los EE.UU., que es una experiencia totalmente diferente. El proceso fue muy rápido ya que decidimos el presupuesto y enviamos en una semana! Le envié a Miss Fely algunos de mis productos de belleza favoritos y viceversa. 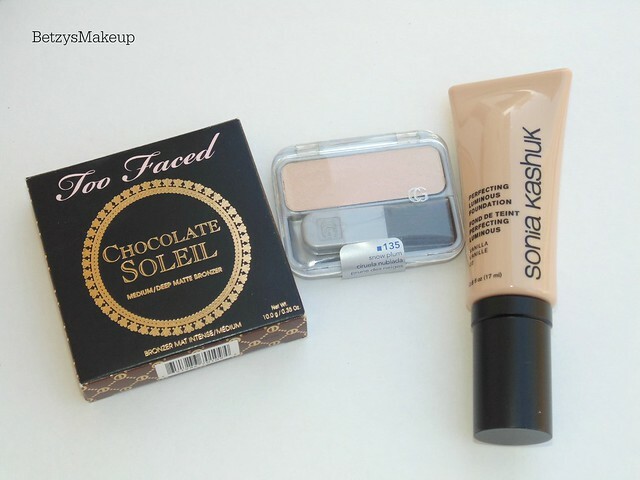 A few of my favorites from the swap include the Too Faced Chocolate Soleil Bronzer, Sonia Kashuk Perfecting Luminous Foundation in Vanilla, and Covergirl Cheekers in Snw Plm. It has been such a long time since I’ve wanted to give the Too Faced Chocolate Soleil Bronzer a try, and it does smell like chocolate! Algunos de mis favoritos de la canje incluyen el Too Faced Chocolate Soleil Bronzer, Sonia Kashuk Perfecting Luminous Foundation en Vanilla, y Covergirl Cheekers en Snw Plm. Ha sido un largo tiempo desde que he querido probar el Too Faced Chocolate Soleil Bronzer y de verdad tiene un olor a chocolate! I have been getting plenty of use from most of the swap and I wanted to share the pigmentation and swatches of the things I received. 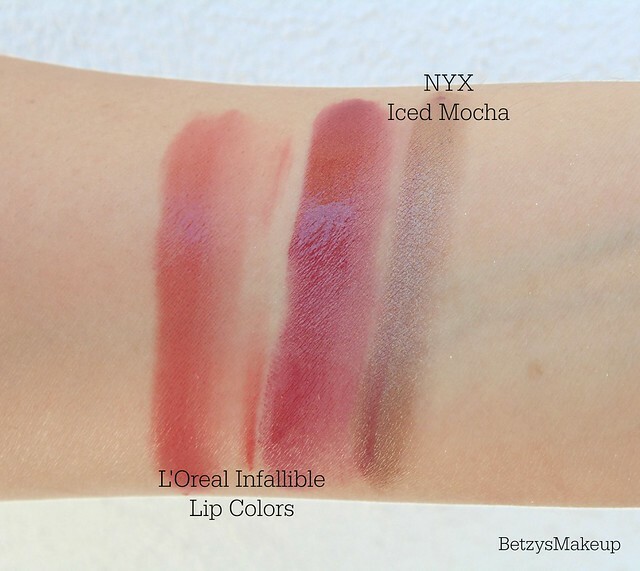 The L’Oreal Infallible Lip Colors do not budge at all! I had to scrub the swatches of my hand in the shower, highly recommend them. He estado recibiendo un montón de uso de la mayor parte de la canje y yo quería compartir la pigmentación y las muestras de las cosas que he recibido. los L’Oreal Infallible Lip Colors no movieron en absoluto! Tuve que limpiar las muestras de mi mano en la ducha, recomiendo encarecidamente. As I mentioned above this was part of a collaboration with Le Fashion Beauty and please don’t forget to stop by her blog to see what I sent her. Thank you so much Miss Fely for sending me so many amazing stuff! Como he mencionado anteriormente esto era parte de una colaboración con Le Fashion Beauty y por favor no olvides de pasar por su blog para ver lo que le mandé. Muchas gracias Miss Fely por enviarme tantas cosas increíbles! Oh wow such goodies. Those lip shades are gorgeous and such a fun idea. what a fun swap 😉 You got some really cool goodies. That is such a great haul. You got some great products here. Awesome, how fun to swap! Love those Loreal lippies, too. So much stuff! 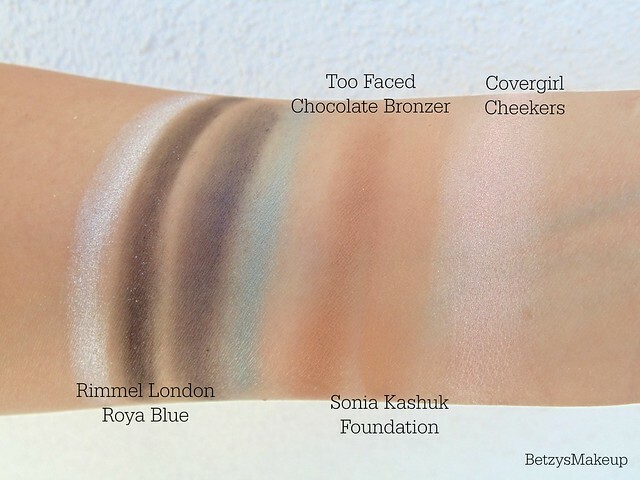 & Good swatches! FUN! You got a great haul! I've never tried any Sonia Kashuk face products- I'll have to check them out! This looks like a great swap! You got some awesome stuff! I love that bronzer. I've done a few swaps with people. If it goes well, it can be awesome! I love trying new things. My fav. is the too faced chocolate bronzer! 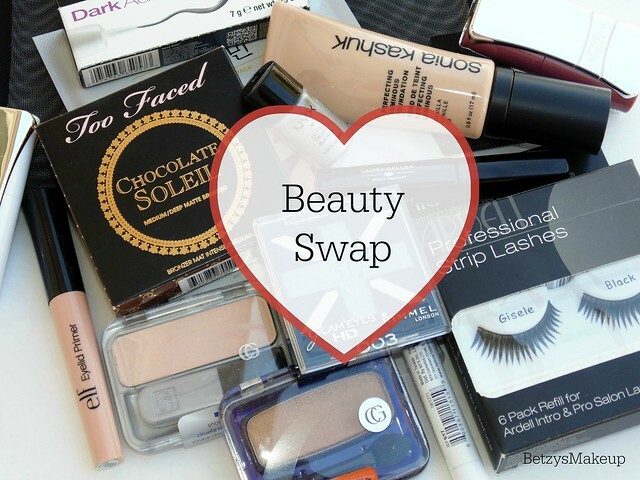 What a fabulous idea to swap with a fellow beauty blogger! This was one amazing swap. Love the idea of a swap, you got some nice goodies !